Whisk the 2 eggs together in a bowl until the yolks are broken and combined with the whites. Season with salt and pepper, if desired. Heat a 8 inch non-stick pan over medium heat. Spray the pan with the olive oil cooking spray. Give the squash a quick 2 minute saute to soften it, remove and set aside. Spray again with cooking spray. When hot (you can test by flicking a bit of water on the pan and it will sizzle when ready), pour half of the egg mixture into the pan. After the edges of the egg begins to set, slip a heat-proof spatula underneath the edge of the eggs and lift the egg towards the center of the pan and tilt the pan, allowing any uncooked egg to run to the edge of the pan. Repeat until the omelet is just set, but slightly moist on the top. Turn the heat to low, add the squash mixture and tomatoes to the center of the omelet. Season to taste with salt and pepper. Sprinkle with fresh basil and feta. Fold each side of the omelet in towards the center. Transfer to a plate and serve. Eggs are one of my fastest, last minute dinners to serve our family, and omelets are probably our favorite. They're so quick and you can fill them with such a variety of fillings for different flavors every time. A lot of people think making a good omelet is hard to do, but really all you need is a good non-stick pan and the rest is pretty simple. I don't do any of those fancy flip the egg arm movements. Instead I fold the omelet up like a little crepe or burrito. 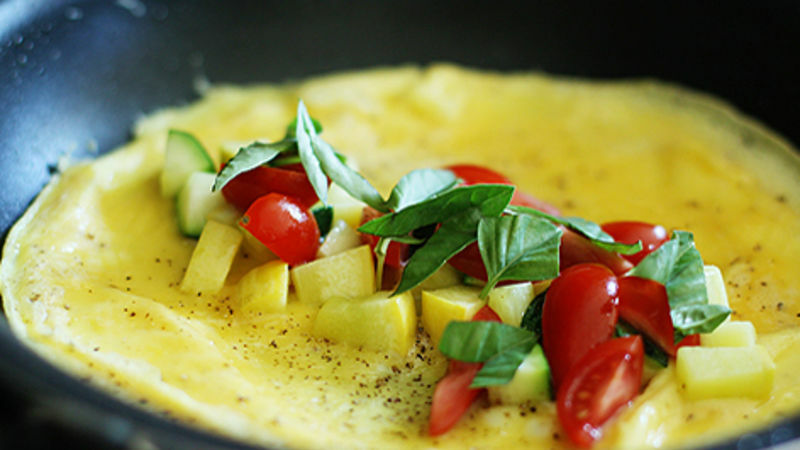 This Easy Garden Omelet is a great recipe to use up the last of summer squash and tomatoes before fall comes. I like to use a little of yellow squash and zucchini, but you could use just one or the other if you prefer. Add in a little tomato, fresh basil, and a sprinkling of feta cheese and you've got a quick, delicious, and healthy dinner in no time!